Dental implants are artificial roots placed into the jaw to support some type of tooth replacement. These replacements can be crowns, bridges, dentures, or some type of hybrid. The most common material implants are made of is titanium. Implants are the closest thing in form and function to a real tooth that dentistry has to offer. Implants have been in use much longer than most people realize. 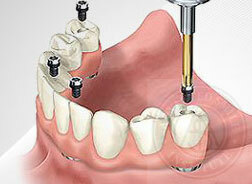 The use of implants in the form we know in dentistry began in the 1950's. Many designs have been tried since then, each improving on the search for more reliability. Today, most implants resemble a root shape with screw-like threads. Recently, the focus has been on the surface coatings or finishes of the implant to help it adhere to the bone. Over the years, the reliability of implants has increased to the point that they are one of the most reliable forms of treatment. Most experts agree on at least 99% successful, assuming they receive adequate care. Not everyone is a candidate for implants, and this can be for a variety of reasons, not only because of conditions in the mouth, but also elsewhere in the body. Carefully following the guidelines, implants can restore your smile with more comfort and reliability, in ways never before possible. At Advanced Smile Institute, we offer all phases of implant dentistry from beginning to end. From the surgery to place the implant, to the cosmetics of placing the final restoration. With most implants, there is no need to go to different places to accomplish everything.